of Pat's BBQ in Salt Lake, you really need to try it. My husband and I heard about it while watching the Food Network's "Diners, Drive-in's & Dives". Hubby loves good barbecue, so we of course had to try it out. It did not disappoint. I've lived in Texas and in South Carolina and I've had some of the best BBQ known to man. That being said, Pat's ranks right up at the top...and it's in Utah of all places. Really if you haven't been...make a point to try it out. And be sure and try the meat loaf...yes I said meat loaf! Who knew...but it's heaven on a plate! In the mean time, if you want some good pulled pork from home. This recipe is also a favorite. It's a bit on the spicy side, but the cool, creamy slaw on top really tones down the heat. It makes for a scrumptious combo! 1. Place the pork, fat side up, in a roasting pan fitted with a rack insert. 2. Place the salt, pepper, brown sugar, paprika, thyme leaves, garlic, vinegar, and cayenne in a food processor and pulse until well combined. Add extra-virgin olive oil until you have a nice paste. 4. Cover the pork with plastic wrap and marinate in the refrigerator for at least 3 hours or up to overnight. 5. Allow the meat to sit at room temperature for 30 minutes before cooking. Preheat the oven to 325 degrees F.
6. Roast the pork for 3 1/2 hours, uncovered, until the outside is crispy-brown (it should look like mahogany). 7. Let the meat rest on a cutting board for 10 minutes before slicing. 8. While the pork is cooking, prepare the slaw. Combine the mustard, mayonnaise, sour cream, lemon juice, vinegar and sugar. 9. Mix well and add finely sliced Savoy cabbage, purple cabbage, green onions and carrots. Season with salt and pepper, to taste, cover with plastic wrap and set aside in the refrigerator until you are ready to serve. 10. To serve, cut the brioche buns in half and pile up some sliced pork. 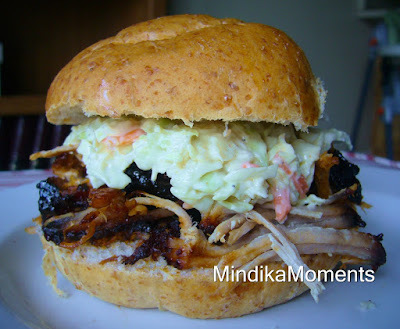 Top with a large spoonful of coleslaw and place the top half of the bun on top. Garnish with parsley. Your sandwich looks fabulous! I'll have to try Pats! Holy crap mindi I must have this now! That looks freaking delicious! A lot of work but delicious! Can I just pay you to come to dinner the nights you make this? Like 10 bucks a person? Iliana, we'll have you over next time I make this for sure. It always makes a ton and we end up eating it as left over for a week. And you don't have to pay me. I want to come too! This is my absolute favorite meal! My dad is from NC and I've had some fabulous bbq too but that looks AMAZING! We love Pat's place. Adam takes most of his clients there for lunch all the time. And it's in the most odd location ever! Have you been to the smoking apple yet? We liked it even more than Pat's.